Last week Punk rock and UFOs released an exclusive interview with Don Siedenburg; a man who claims he took part in a military experiment where he was fed a food source from a crashed UFO. The only previous info about this case was a video interview by Jordan Pease from 2016, as since then MUFON scoffed at covering the case, and the fascinating story sat in cyber space limbo. “I believe Don is very honest and sincere, and his story deserves much more attention,” said Pease on a Facebook posting replying to the initial Punk rock and UFOs link. Siedenburg was not only happy to have his story told, but eager to provide documentation of his records to help back-up his story. Siedenburg was a mostly C student in high school, but said after being fed the serum his focus improved. At 83- years old he swims over a mile a day, is in tremendous shape and is quite the basketball sharpshooter. The Dd214 form was shown to a Marine, and it is verified to be a legit form. The only thing the Marne noted that was odd was that the spelling of his name should have been corrected at some point. His recent blood work was shown to a nurse for evaluation, and the reaction was that the data is considered “exceptional” for an 83-year old man. A Don Siedenburg built replica of what he believes to be a method of exercise used on UFOs. Siedenburg also claims as part of the experiment that fed him the serum he was also given a device Siedenburg describes as “isometric exercises from outer space.” Siedenburg built a replica of what he believes is a rod used for exercise and sent it to Punk rock and UFOs. Now this could very well be just a piece of a crashed UFO that those in charge of the experiment assumed it was for exercise use , or just a rod of metal from earth used for a placebo effect in the experiment, or just a piece from an alleged UFO that they have no idea what the actual use for it is. Siedenburg’s favorite use of the tool was to hold the bar up as long as he could and isolate his muscles while doing so. 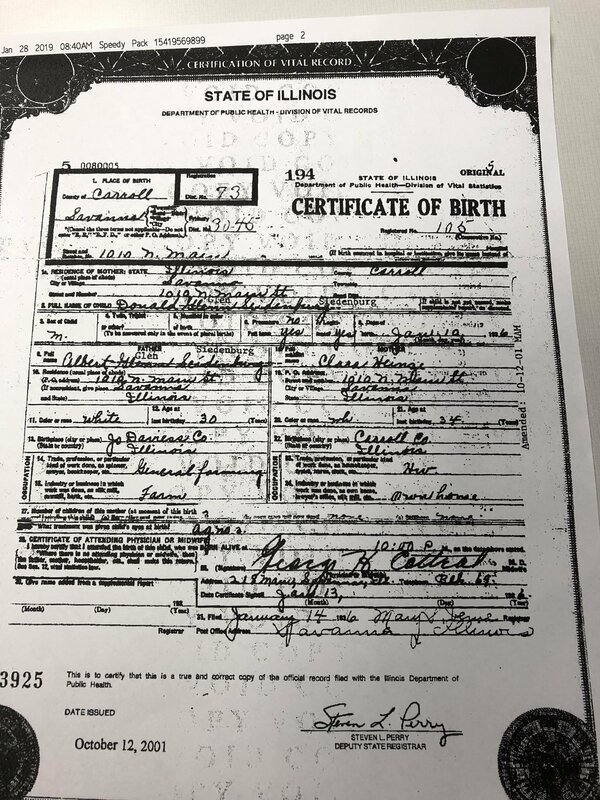 Copy of my birth certificate to show they made a mistake on the spelling of my last name. They wrote Seidenburg and it should have been Siedenburg. I missed this when I enlisted and kept the Seidenburg name until I had it changed on Oct. 12, 2001. Copy of my Permanent - Final High School Grades Record. I later found out I had Attention Deficit Disorder before they knew what that was. Over the years, I believe the "serum" helped my learning ability. Copy of my U. S. Army DD214 showing a perfect record over my three year enlistment. , notice of The l5. Copy of my Honorable Discharge Certificate and 973 Military Records Fire at the National Personnel Records Center. Article from the local Grants Pass Newspaper.